Destination Chesterfield respects your privacy and is committed to protecting your personal data. This privacy notice will inform you as to how we look after your personal data and tell you about your privacy rights and how the law protects you. This privacy notice is provided in a linked format so you can click through to the specific areas set out below. Alternatively, you can download a pdf version of the policy here. Destination Chesterfield is a public private partnership which promotes Chesterfield as a place to live, work, visit and invest. It is led by an independent board of directors. Chesterfield Borough Council is the partnerships financially accountable body and we operate under a service level agreement with East Midland Chamber (Derbyshire, Nottinghamshire and Leicestershire) , to employ staff, host the organisation and manage IT, insurance and policies. Due to Destination Chesterfield not being a statutory body East Midlands Chamber (Derbyshire, Nottinghamshire and Leicestershire) takes the role as the ‘Data Controller for the partnership. This privacy notice aims to give you information on how Destination Chesterfield collects and processes your personal data, including any data you may provide through this website, when you sign up to our newsletter, complete a call back or general enquiry form, meet with a member of the Destination Chesterfield team, purchase / book a product or service or take part in a competition or survey. Other bodies/entities/partners linked to Destination Chesterfield may have different practises, though the commitment to your privacy will always be the same. You are encouraged to review the privacy statements of other bodies/entities/partners when visiting their website(s). East Midlands Chamber (Derbyshire, Nottinghamshire, Leicestershire) is the controller and responsible for your personal data. East Midlands Chamber have appointed a Data Quality Officer (DQO) who is responsible for overseeing questions in relation to this privacy notice. If you have any questions about this privacy notice, including any requests to exercise your legal rights, please contact the DQO using the details set out below. • Profile Data includes purchases or orders made by you, your interests, preferences, events attended, feedback and survey responses. • Usage Data includes information about how you use our website, e-marketing, products and services. • Additional Data includes the provision of a curriculum vitae or completed application form in response to a job vacancy, student placement opportunity or work placement. Third parties or publicly-available sources. • Customer administration and account management. We will get your express opt-in consent before we share your personal data with any company outside Destination Chesterfield for marketing purposes. You can ask us or third parties to stop sending you marketing messages at any time by contacting info@chesterfield.co.uk or calling 01246 207207 and asking to speak to a member of the Destination Chesterfield team or by following the unsubscribe links on any marketing message sent. • External Third Parties as set out in the Glossary . We do not knowingly transfer your personal data outside the European Economic Area (EEA). If we use a third party supplier which may hold data outside of the EU they will have in place the policies to apply with the EU regulations. In certain cases the Destination Chesterfield Partnership is funded through public funds, and as such we are required to keep data for a variety of legal, regulatory or technical reasons. In some cases, records must be maintained for auditory purposes by funding bodies. We will make sure that your privacy is protected and is only used for those purposes. 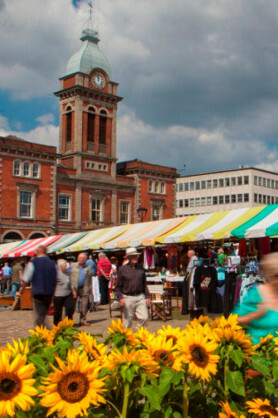 • Business partners, suppliers and sub-contractors for the performance of a part or fully funded Council or European funded contract in which Destination Chesterfield is a contracted partner. • Service providers acting as processors which provide Marketing, IT and system administration services. • HM Revenue & Customs, regulators and other authorities acting as processors or joint controllers based in the United Kingdom which require reporting of processing activities in certain circumstances.